An 8th Reconnaissance Regiment anti-tank crew helps guard the road near Dunkirk on Sept. 16, 1944. During September 1944, 2nd Canadian Infantry Division was involved in a series of very tough battles in northern France. On the morning of the 7th, the 8th Cdn. Reconnaissance Regiment, also known as the 14th Cdn. Hussars, was moving well in front of the infantry when it ran up against strong German positions in the villages of Bourbourgville and Gravelines near Dunkirk. Field Marshal Bernard Montgomery, who had not yet made up his mind about future strategy, wanted the Canadians to secure all of the Channel ports and so operations to clear the outer ring of Dunkirk’s defences got under way immediately. The 5th Cdn. Inf. Brigade had missed the worst of the terrible struggle for the Forêt de la Londe, a rugged wooded area northwest of the town of Elbeuf. The brigade began the operation with the Royal Highland Regt. of Canada–the Black Watch–seizing a bridging site south of Bourbourgville and establishing a base for the advance. The approach had been difficult due to harassing fire from 75- and 88-mm guns, but the 5th Field Regt. was soon ready to deal with this and the Maisonneuves entered the town using boats supplied by the eager citizens or by swimming. Other soldiers, including Major Jacques Ostiguy’s C Company, used an improvised plank footbridge. The railway station was strongly defended with two 20-mm anti-aircraft guns deployed as anti-infantry weapons. No one was anxious to face this barrage until J.P. Leblanc dashed into the street and–while lying down–provided enough covering fire to silence the guns and get his men moving forward. The town was not freed until several hours before dawn, but this did not stop the population from celebrating the liberation in parts of the town that were clear. The Calgary Highlanders moved north to the village of Loon Plage shortly after first light. Les Planches, a handful of houses halfway to their objective, was taken quickly by the lead company under Major Dalt Heyland, but when the next “bite”–a road junction–was reached, enemy artillery pounded the area. It was difficult to dig in and impossible to move forward. D Company moved around the flank to approach Loon Plage from the west, but it was halted at a farm 455 metres outside the village. The Maisonneuves had started north quickly enough, but A Company’s lead platoon had gone less than a kilometre when it ran into a carefully concealed German position. The platoon got into some farm buildings, with carefully controlled fire and movement, and an all around defensive position was created. The company commander, Major Alexander Angers, was wounded along with a dozen others. A Company’s lead platoon was surrounded and unable to move without attracting artillery and direct fire. Fifth Field Regt. was contacted and it responded quickly by bringing down a barrage and allowing the Maisonneuves to withdraw from the burning buildings they had found cover in. The Maisonneuves, like the Calgaries, tried to invest the Dunkirk perimeter against formidable odds. The enemy had ample supplies of artillery shells, enough–as it turned out–to defend Dunkirk until the war was over. The enemy also had good daylight observation points and an intimate knowledge of the terrain. The Canadian infantry battalions, meanwhile, were operating without any armour or air support, and without a clear mission. They were pressing forward without time for reconnaissance and without making full use of intelligence from the French resistance forces in the area. On the right flank of the brigade, the Black Watch was trying to carry out an attack without adequate support. Major Alex Pinkham’s C Company was teamed up with a troop of armoured cars from 8th Recce Regt. Its objective–Coppenaxfort–was some 5,000 metres east of Bourbourgville along a single, straight and elevated road on the bank of a canal. There were no trees, no shrubs–no cover of any kind. The company’s soldiers could only move in single file, taking care to space themselves out considerably. The first armoured car was roughly 100 yards behind the lead troops, but it was soon knocked out by a heavy anti-tank gun. Mortars and field guns struck at the infantry who tried to dig in. Fifth Field Regt. was short of ammunition and fully committed to the Calgaries and Maisonneuves. So, the Black Watch had to wait until dark to withdraw and regroup. The next morning a single platoon of C Company, assisted by one armoured car, rushed the bridge leading into the town only to discover that the Germans had withdrawn. These gains meant little to 5th Bde. because it was now occupying positions the Germans had carefully surveyed as artillery targets. Throughout the following weeks, the brigade used fighting patrols to harass the enemy and battalion attacks to compress the perimeter. After a furious battle, the Black Watch captured the town of Spycker on Sept. 11. The Germans launched a strong counterattack that resulted in many casualties. Lieutenant Joe Nixon and his scout platoon played a crucial role in stopping the counterattack. Nixon personally handled a PIAT (Projector, Infantry, Anti-Tank) gun while his sniper scouts successfully targeted enemy infantry. One sniper, Private Frank de Lutio, won the Military Medal for his efforts that day, but the cost of holding the village was too high and the Black Watch withdrew on the night of Sept. 13. Division was pressing brigade for information, but patrols to obtain it could be costly. Lieutenant Charles Forbes of the Maisonneuves dealt with one request by donning a priest’s cassock and beret. Remarkably, he walked up to and through the German position and returned with a full report. On the other side of Dunkirk, 6th Bde. operated with the assistance of the highly organized Belgian White Bde., the national resistance movement of the Belgian armed forces. The White Bde. was able to provide a detailed plan of the enemy’s defences, including its mined areas near the Belgian-French border. But when the brigade advanced along the coast, it met strong opposition. The South Saskatchewan Regt. was forced to deal with a major enemy strongpoint nestled in sand dunes thick with mines and carefully sited machine-gun posts that were connected to the main position by tunnels. The SSRs were virtually a brand new regiment, rebuilt with reinforcements after the nightmare at Forêt de la Londe had removed most of the men who had survived the battles of the Normandy beachhead. Its task was not made any easier by the supply crisis that led to a shortage of artillery ammunition. An initial attack faltered under withering fire, but a second attack succeeded in breaching the outlying defences. However, an attempt to go forward on the next bound was stopped cold and the assault companies withdrew to their start-line. The guns of the 3rd Light Anti-Aircraft Regt. and the 2nd Anti-Tank Regt. were brought up and an attack by Typhoons of 84 Group was put in. Unfortunately, the additional firepower was ineffective. Brigadier J.G. Gauvreau went forward to direct the SSR to close with its objective, but before another attack was launched a surrender demand was accepted by the Germans late on the night of Sept. 12. The German garrison was unwilling to resist any longer because it had been told of the fall of the city of Le Havre and the capture, by the Essex Scottish Regt., of a neighbouring strongpoint. The SSR joined its sister regiments at Bray Dunes where the Fusiliers Mont-Royal and the Queen’s Own Cameron Highlanders of Canada were engaged in a bitter, close battle against much more determined defenders. The Camerons attempted–to no avail–to outflank the defences of Bray Dunes Plage by traversing the sand dunes along the shoreline. Further attempts on the 13th and 14th were equally unsuccessful. Typhoon aircraft hammered the defences, but coordination with the infantry was non-existent. It was not until the full brigade was committed in a series of sector attacks that the position was overcome on Sept. 15. Fourth Bde. had begun clearing the coast south of Ostend, but it soon ran into a well-defended strongpoint at Westende. 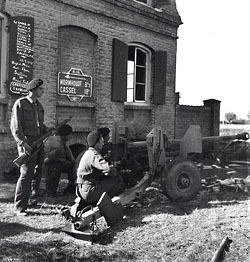 The Essex Scottish, with platoons of the Toronto Scottish, conducted a siege operation in miniature with mortars and 17-pounder anti-tank guns from 2nd Anti-Tank Regt. It exchanged fire with four large, vintage naval guns. To the south, the Royal Hamilton Light Inf. and the Royal Regt. began to advance on Bergues, a beautiful fortified town that appeared to be strongly defended. The steady drain of casualties was affecting all nine infantry battalions and the division had not begun to tackle the main Dunkirk defences. It was beginning to look like a very costly operation and there were no regrets when Montgomery decided to mask Dunkirk and transfer 2nd Div. to Antwerp. Fourth Bde. moved first, taking over the defences of the vital docks from 53 Welsh Div. Antwerp was a strange place in September 1944. The civilian population was caught up in the euphoria of liberation and seemed almost oblivious to the presence of the Germans occupying the northern suburbs. Some civilians went about their affairs to the point of crossing back and forth over the Albert Canal from the German to the Allied sector. The Belgian resistance, on the other hand, was active in attempting to extend the dock area perimeter. The Essex Scottish and the RHLI took over the defences and on the night of Sept. 20 the Essex were hit hard by a German attack that was apparently intended to seize and destroy a railway bridge. Heavy fighting raged throughout the night, but the enemy was beaten off. The area around 4th Brigade’s positions was full of water until White Bde. patrols, supported by Canadian artillery, secured the sluice gates. This allowed drainage of the tidal water. The RHLI moved its lines forward to protect the site on Sept. 22. From that date until Oct. 2, no major initiative was taken by either side. The rest of the division made the trek to Antwerp on Sept. 18 and reports from that journey show that the ride across the newly liberated Belgian countryside was an exhilarating experience. “At various points along the way, the entire convoy was showered with gifts of fruit, bread and of course at times with liqueurs. Hand clasping was just as prominent a practice as in France, and the familiar ‘Cigarette for Papa’ slogan greeted us. Fifth Bde. was immediately committed to an advance across the Albert Canal followed by 6th Brigade’s attempts to forge a bridgehead over the well-defended Turnhout Canal. With General Harry Crerar in hospital in England, General Guy Simonds had taken over command of the army. The corps was under the command of Major-General Charles Foulkes. Brigadier R.H. “Holley” Keefler, the division’s senior gunner, commanded 2nd Div. and he decided to deal with the enemy by sending 5th Bde. on a wide flanking movement that made use of a bridgehead across the Turnhout. This manoeuvre was a success, but the brigade soon ran into German battle groups that were determined to hold the canal line north of Antwerp. The fierce battles for the villages of St. Leonard and Brecht paved the way for the rest of the division to begin moving north and on Oct. 2, Simonds told Keefler to “clear the area north of Antwerp and close the eastern end of the Beveland isthmus.” When this was accomplished, orders would be issued to clear Beveland to the north and capture Walcheren Island. The division was thus committed to some of the most difficult battles of the war at the village of Woensdrecht and on the narrow causeway connecting Walcheren Island and the peninsula of South Beveland. The intensity of the conflict in October has overshadowed the memory of the battles of September on the Dunkirk perimeter, the docks of Antwerp and the Turnhout Canal, but for the men who fought there, the losses and the victories were just as real and just as important as in the more famous battles. Today, visitors will find few indications of these encounters. If you seek their monument, visit the Canadian war cemeteries at Calais and Bergen Op Zoom. On the wind-swept hill overlooking the English Channel or in the deeply wooded area east of Bergen you will find places to reflect upon the events of September 1944.